Have you ever climbed a tree? I have. Actually, I've climbed my fair share of trees. I figure, if the peep is gonna grow 'em, I may as well climb 'em. Climbing trees can be a lot of fun. This is how you do it. First, you stake out the desired tree. Then, you watch the tree from afar, making sure that there's a clear path between it and you. You crouch down low and wiggle your bum, always keeping your eyes trained on that tree. You have to be sure it doesn't move. Usually, a couple more bum wiggles are in order then, all of a sudden, you take off. You race toward the tree, still keeping your eyes on it, and leap up into the air. Then you climb... all claws out now... climb and climb and CLIMB. Oh, what a thrill it is. A real adrenaline rush as you make your way into the uppermost branches of said tree. Suddenly, you're up higher than anyone else. Anyone else in the world! You can see for miles... okay yards... but you get the picture. It's an amazing feeling. But then comes the crash. No, it's not about falling out of the tree. Although, if the branch you're on happens to break I suppose you would crash. But put those nasty thoughts out of your mind. What happens is this. You look down. You realise just how high up in the air you are. And you realise, what goes up, must come down. But how do you make that happen? Usually, I wait a little bit. Never know... a peep just might get the big ladder out of the garage and come fetch you. Or better yet, maybe call the fire department? Usually though, a cat has gotta get down from the tree all by himself. It's tricky but definitely can be done. After all, as I said, I've climbed my fair share of trees and have always managed to extricate myself somehow. I'm not stuck up in a tree right now! Don't be so silly. Personally, I like to come down backwards, very slowly and with both eyes closed. Once I'm about a peep's height from the ground, I'll sneak a peek and then jump the rest of way. Quite often, there will be a peep standing there, arms stretched out, calling to me to jump. I've thought of jumping into their arms but then I figure, why make myself beholden to a peep? No, best to just jump straight onto the ground. What I am considering though is to ask the peeps to stack soft landing things below all my favourite trees. I could do that. That wouldn't make me too beholden. Plus, it would stop the complaints when I land in peep #1's flower beds. Hey, that would make her beholden to me. I like that idea. Yes, I like it very much. 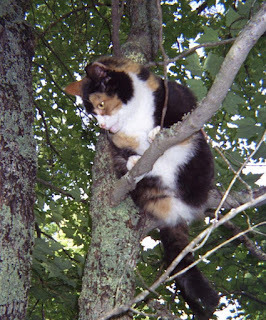 When I was a young kit, I got outside and climbed the big spruce tree outside our house. I walked right out on a branch about 10 feet up. My mom was besides herself because I refused to come down. She ended up getting a ladder, climbing up and getting me down. She really ruined my fun. I bet it's both scary and adorable watching you climb down backwards! you got some good ideas there about the soft landing stuff..
Popped over from Mario's blog to visit. There are lots of adventures to be had outside, aren't there?